Racist Religious Right Republican (R4) US President Donald Trump is making indignant claims about Fake News and Media Bias on a daily basis that are variously disputed by his opponents. However his latest claim that he is being censored by Google does have some substance. Zionist-dominated Google heavily censors important assertions by both Donald Trump and Al Gore about US Government passive complicity in the 9-11 atrocity. Google similarly effectively heavily censors assertions by former US-installed Afghan President Hamid Karzai disputing the lying Bush “official version” of 9-11 and the very existence of Al Qaeda in Afghanistan. The UK BBC and Australian ABC totally censor these hugely important and authoritative assertions. In contrast, Searches on Bing (owned by Microsoft) yield numerous results on these matters, notably reports in major Mainstream media. We are subject to massive Mainstream media fake news through lying by omission. Donald Trump spouts a lot of things that are outright wrong or of extremely dubious veracity (e.g. about war, man-made climate change, Palestine, Iran, Muslims, Mexicans, protectionist policies etc). I do not have the time, resources or inclination to investigate the veracity of this latest specific claim by Donald Trump about Google censorship. However, as I will demonstrate below, in this instance Trump does have a valid general point – Google can be indubitably shown to be censoring Donald Trump and indeed others about the really important, Elephant in the Room matter of who was responsible for the 9-11 atrocity. There will always be complaints about media coverage because Mainstream media may not attach the same importance to an issue as the complainant does. Indeed there is a wealth of evidence that in the post-WW2 era US and US lackey Western Mainstream media have been involved in massive lying by commission and omission in the interests of the US Government, and that this massive mendacity continues unabated [2-16]. Arjun Walia has analysed massive CIA subversion of media and academia (2017): “National security” is now an umbrella term used to justify concealing information, but who makes these decisions? …. Not only are countless documents classified every single year in North America, but false information and “fake news” are routinely dispersed, mainly by mainstream media outlets — a reality that is clearly conveyed in this document and has been expressed by multiple mainstream media journalists themselves. And as with the NSA surveillance program that was exposed by Edward Snowden, it’s a global problem… What we seem to have here is an attempt to manipulate public perception of global events through mainstream media and news publications. But what’s perhaps most interesting is the fact that a lot of people are now waking up and seeing through many of these lies and manipulation tactic” . Of course the classic work in this area detailing massive US Government abuse of media is “Manufacturing Consent. The political economy of mass media” by Professors Edward Herman and Noam Chomsky in which these esteemed authors declare: “In sum, the mass media of the United States are effective and powerful ideological institutions that carry out a system-supportive propaganda function by reliance on market forces, internalized assumptions, and self-censorship , and without any significant overt coercion. This propaganda system has become even more efficient in recent decades with the rise of the national television networks, greater mass-media concentration, right-wing pressures on public radio and television, and the growth in scope and sophistication of public relations and news management”( page 306, 2002 edition ). However one can imagine few issues as serious as government complicity in the 9-11 atrocity (3,000 people killed) that sparked the US War on Terror that in horrible reality has been a US War on Muslims in which 32 million Muslims have died from violence, 5 million, or from imposed deprivation, 27 million, in 20 countries invaded by the US Alliance since the 9-11 atrocity . It must be noted that numerous science, architecture, engineering, aviation, military and intelligence experts have concluded that the US Government must have been involved in the 9-11 atrocity , with some concluding that Apartheid Israel must also have been involved . 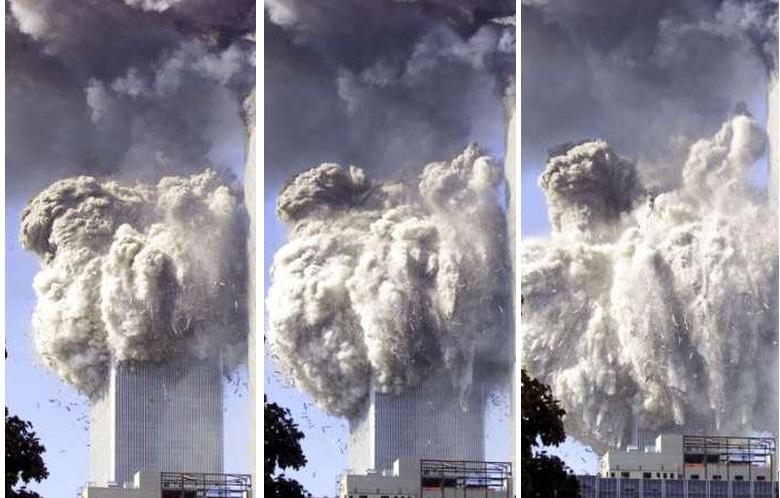 Many Americans, including Republican President Donald Trump [18, 19] and former Democrat Vice-President Al Gore [18, 20], have concluded that the US Government was passively complicit in the 9-11 atrocity by not responding to a flood of pre-9-11 intelligence warnings. Former US-installed Afghan president Hamid Karzai has declared himself to be agnostic about the lying “Bush “official version” of “who did 9-11” and has denied the very existence of Al Qaeda in Afghanistan that was the US “excuse” for the devastating US invasion and long-term occupation of Afghanistan [18, 21]. These powerful statements from powerful, intelligence-connected leaders are at variance with the “official version of 9-11” that is blindly accepted by US lackey Western Mainstream media and promulgated by pathological liar and serial war criminal, George W. Bush whose Administration has been expertly documented as uttering 935 lies between 9-11 and the war criminal invasion of Iraq [18, 22]. However, how do Google and the Microsoft-owned Bing report these utterances from Trump, Gore and Karzai? As set out below, Google censorship has effectively “hidden” these important statements by Trump, Gore and Karzai while, conversely, searches using Microsoft’s Bing readily reveal them. Google censorship of Donald Trump re 9-11. President Donald Trump on the failure of the US Government to respond to pre-9-11 intelligence warnings (2018): “They knew an attack was coming. George Tenet, the CIA director, knew in advance that there would be an attack. And he said so to the president, and he said so to everybody else that would listen. And that came out. The other thing is, the FBI, the NSE and the CIA were not talking to each other. These are the three main agencies. And they weren’t talking to each other and they weren’t talking because they didn’t like each other. And they had a lot of problems getting along. And that’s leadership. You have to, you know — you have to get your three main agencies to talk to each other. They had a lot of information that, if it could have been correlated, it would have been very, very helpful…You know, as President Truman said, the buck stops here. Whether you like it or not, Truman would have said — He wouldn’t have been talking about after the attack. He would have said the buck stops here. But you had the FBI, NSE and the CIA, all three, they weren’t talking to each other. Now, you know, say what you want. But then we went out and attacked the wrong country, because we went out and attacked Iraq. They had no weapons of mass destruction, as you know, and as we found out, and as we found out in spades. So they had no — We destabilized the entire Middle East. I mean, this is all — the Middle East is a mess right now because of Iraq, because we totally destabilized. And the two powers, Iraq and Iran, one got decapitated, and Iran now is taking over the Middle East, taking over Iraq, taking over the oil. And the other one that gets some of the oil is ISIS. OK? So we fueled and created ISIS out of this…” [18, 19]. A Google Search for Trump’s key phrase “They knew an attack was coming. George Tenet” yields 16 results (including 2 from my writing). This Google Search omitted certain results but a “repeat [of] the search with the omitted results included” yields 72 results (with 58 from my writing). The 14 results not due to me included results from only 9 variously well known media, namely Real Clear Politics, WSJ, Rove, Fox News, CNN, National Review, MSNBC, Today, and Mainstreet Liberal. However in stark contrast, a Search using Bing (a Microsoft search engine) for the same phrase yields 13,700 results, topped by my writing (number 1 on page 1) and including articles from variously well-known media e.g. just on pages 1 and 2, Politico, Yahoo, Real Clear Politics, Politifact, Rove, CBS News, National Review, RT, Fox News, 911blogger, Infowars, PBS, NY Daily News, The New Civil Rights Movement, Independent, Daily Mail, and Washington Post. Google has effectively “hid” one of the most important utterances of Donald Trump. Google censorship of Al Gore re 9-11. Former Vice-President Al Gore (author of “An Inconvenient Truth”, Nobel Peace prize winner with the IPCC in 2007, former US Vice President under Bill Clinton, and denied the presidency in the 2000 election by the Supreme Court vote and Florida ballot rigging) on Bush failure to act on intelligence warnings in which “the entire warning system was “blinking red” (2007) : “Our top priority should be preserving what America represents and stands for in the world and winning the war against terrorism first. The Bush White House has asked us to concentrate exclusively on this threat. Tragically, however, they completely failed to protect us against the worst terrorist attack in American history. Most Americans have tended naturally to give the Bush-Cheney administration the benefit of the doubt when it came to its failure to take action in advance of 9/11 to guard against an attack. After all, everyone knows from experience that hindsight casts a harsh light on mistakes that should have been visible at the time they were made. But now, years later, with the benefit if investigations that have been made public, it is no longer clear that the administration deserves this act of political grace from the American people… The CIA was also picking up on unprecedented warning that an attack on the United States by [formerly US-funded] Al Qaeda was imminent. Indeed, George Tenet wrote that the entire warning system was “blinking red”. We also know from Bob Woodward’s reporting, and from confirming evidence, that CIA chief George Tenet was frantically trying to communicate the same warnings in June and July 2001 to Bush’s national security adviser Condoleezza Rice, and that he was blown off. These affirmative and repeated refusals to listen to clear warnings constitute behavior that goes beyond simple negligence. At a minimum, it represents a reckless disregard for the safety of the American people [ and at a maximum …?] [18, 20]. A Google Search for the key Al Gore 9-11 judgement that “George Tenet wrote that the entire warning system was blinking red” yields only 4 results (all writings by me). In astonishing contrast, a Bing Search for “George Tenet wrote that the entire warning system was blinking red” yields 76,400 results, with well-known Mainstream media in the first few pages including NBC, Fox, Economist, Business Insider, Washington Post, CBS and Breitbart . Google has effectively “hid” one of the most important utterances of Al Gore. Google censorship of Hamid Karzai re 9-11. Hamid Karzai (former US-installed Afghan President) in an astonishing Al Jazeera interview disputing Al Qaeda presence in Afghanistan and the “official version” of 9-11 (10 September 2015): “[Al-Qaeda] is for me a myth […] For us, they don’t exist. I don’t know if al-Qaeda existed and I don’t know if they exist. I have not seen them and I’ve not had any report about them, any report that would indicate that al-Qaeda is operating in Afghanistan… [re Osama bin Laden and Al Qaeda role in 9-11] That is what I have heard from our Western friends. That’s what the Western media says. There is no doubt that an operation, a terrorist operation was conducted in New York and in Washington… I neither believe nor disbelieve something that I don’t know about. I can tell you that Afghanistan was as much a victim of terrorism as was America, as were the people who were killed in the September 11th terrorist attacks” . A Google Search for Karzai’s assertion that “I don’t know if al-Qaeda existed” yields only 30 results (including 3 due to me) with some from Mainstream media e.g. Al Jazeera, Politico, The Week, Reddit, Daily Sun, and Nation . In contrast, a Google Search for the phrase “Al Qaeda did 911” yields 6,860 results. A Bing Search for “I don’t know if al-Qaeda existed” yields 44,200,000 results, although many of these results do not refer to Karzai’s specific statement and merely question the lying Bush “official story” of Al Qaeda involvement in 9-11. Censorship by Google and other Mainstream media. Google censorship of extraordinarily important statements by major figures Trump, Gore and Karzai simply helps provide further support among the brain-washed public for the Orwellian lying Bush “official story” about 9-11. Such active censorship amounts to intentional lying by omission which of course is far, far worse than lying by commission because the latter at least allows the possibilities of public refutation and public discussion. Thus, for example, holocaust ignoring and genocide ignoring (e.g. the ignoring of the ongoing, Zionist-imposed Palestinian Genocide , the Iraqi Genocide , the ongoing Afghan Genocide , and the ongoing, Zionist-promoted, US-imposed Muslim Holocaust and Muslim Genocide  that is entrenched in Western Mainstream media) are far, far worse than repugnant holocaust denial and genocide denial because at least the latter allow for refutation and debate. Indeed one of the worst examples of Google censorship is that of the progressive and humane Canadian web magazine MWC News and relates to the very exposure of this lying by omission as exampled above. In 2017 I published an article in MWC News entitled “Mainstream media – fake news through lying by omission” . If you Google “fake news through lying by omission” you get 68 results but if you exhaustively read through the 7 pages of results you find that zero (0) are for the MWC article. However, having waded through all the results one encounters a Google message “In order to show you the most relevant results, we have omitted some entries very similar to the 68 already displayed. If you like, you can repeat the search with the omitted results included” [by clicking on the link provided] . This“inclusive” Search brings up 385 results with the MWC News article now number 8 on page 1 – but who is going to search fruitlessly through 7 pages and then search through another set of pages? About 90% of Google searches are confined to page 1 – analyst Steve Toth observes: “According to Search Engine Watch, 92% of search traffic comes from page 1” [27, 28]. In stark contrast, a Bing Search for “fake news through lying by omission” yields 2,030,000 results with the Google-censored MWC article number 1 on page 1. The MWC News article commences: “Fake news is simply a new, Trump-popularized descriptive for media lying that occurs in 2 basic forms, lying by omission and lying by commission. Lying by omission is far, far worse than lying by commission because the latter can at least admit refutation and public debate. Western Mainstream media impose a huge burden of fake news on Western societies through entrenched and pervasive lying by omission. Indeed the most egregious and pervasive Mainstream media lie of omission is suppression of reportage of such lying by omission. The unimpeded, remorseless, corporate-dominated Mainstream media, politicians and pliant intellectuals are now going further, and variously threatening residual effective free speech and Alternative media on the basis of asserted fake news” . And the irony is that Google suppression of the MWC News article is simply another example of Mainstream media fake news through lying by omission. Google has a very high Jewish Zionist Board membership. The US corporation Alphabet ($59.62 billion revenue in 2016) is the new holding company that owns fervently pro-Zionist Google that “minimizes” Leftist sites critical of Apartheid Israel. The American 60% of the world’s 30 biggest media companies have a disproportionately high Jewish Board membership. Jews and females represent 2% and 51%, respectively, of the US population but average 33% and 19%, respectively, of Board members of the top 18 US media companies. Alphabet is the biggest of the world’s top 30 media companies and 46% of Alphabet Directors are Jewish or have Jewish spouses but only 23% of Board members are women. Alphabet chairman John Hennessy is anti-BDS (Boycott Divestment and Sanctions against Apartheid Israel) and hence pro-Zionist . In addition to outrageously minimizing the humane Left on Google Searches (as quantitatively exposed by the World Socialist Web Site, WSWS) , Google provides software to identify targets for illegal and war criminal US drone strikes throughout the Muslim world from Libya to Pakistan . By way of comparison, Microsoft ($4.58 billion in revenue in 2016) owns search engine Bing, Skype, and the Xbox Live gaming and media platform, and gets advertising revenue via MSN. Microsoft has a 18% Jewish (and hence presumed Jewish Zionist) Board and an 18% female Board. As detailed above, Bing Searches reveal humane items hidden by the Zionist-subverted Google Robot. Microsoft ranks number 17 among the world’s top 30 media companies . One notes that silence is complicity and, unlike ordinary people, the super-rich (such as Big Corporate Board members) have effective free speech (e.g. they are media-sought “public figures” and indeed can readily afford to take out full-page advertisements in major newspapers). Accordingly, in the absence of public, ethical dissociation from the appalling crimes of the self-asserted “Jewish State” (nuclear terrorism, serial invasions, serial war crimes, active and passive mass murder, large-scale human rights abuse, ethnic cleansing, Nazi-style race laws, and Apartheid), one must assume that Jewish corporate Board members are Jewish Zionist Board members. Of course Google is not the only Mainstream media organization to censor Elephant in the Room realities in the interests of Zionist-backed US imperialism. Thus Searches of the US lackey UK BBC for Trump’s phrase “They knew an attack was coming. George Tenet”, Gore’s phrase “George Tenet wrote that the entire warning system was blinking red”, and Karzai’s phrase “I don’t know if al-Qaeda existed” all yield zero (0) results. Similarly, Searches of the US lackey Australian ABC (Australia’s equivalent of the UK BBC) for Trump’s phrase “They knew an attack was coming. George Tenet”, Gore’s phrase “George Tenet wrote that the entire warning system was blinking red”, and Karzai’s phrase “I don’t know if al-Qaeda existed” all yield zero (0) results relating to the original utterances. The US lackey UK BBC and the US lackey Australian ABC have an appalling record of fake news through lying by omission . In summary, it is clear that Google not merely censors President Donald Trump but effectively heavily censors one of his most important utterances, that relating to US Government passive complicity in the 9-11 atrocity. Google similarly effectively heavily censors a similar assertion by former US Vice-President Al Gore asserting US Government passive complicity in the 9-11 atrocity, and censors assertions by US-installed Afghan President Hamid Karzai disputing the lying Bush “official version” of 9-11 and the very existence of Al Qaeda in Afghanistan. The UK BBC and Australian ABC totally censor these hugely important and authoritative assertions. In contrast, Searches on Bing (owned by Microsoft) yield numerous results on these matters, notably in major Mainstream media. While Google effectively hides an MWC News article entitled “Mainstream media: fake news through lying by omission”, a Bing Search for “fake news through lying by omission” yields the MWC News article as number 1 on page 1 of 2,030,000 results. Memo to R4 President Donald Trump and indeed everyone: Bing it!
. Jim Waterson and Edward Helmore, “Trump accuses Google of promoting Obama’s speeches over his”, Guardian, 30 August 2018: https://www.theguardian.com/us-news/2018/aug/28/donald-trump-google-news-service-is-rigged-against-me .
. Gideon Polya “Google censorship & Zionist constraint on effective free speech threaten the Planet”, Countercurrents, 9 August 2017: https://countercurrents.org/2017/08/09/google-censorship-zionist-constraint-on-effective-free-speech-threaten-planet/ .
. Donald Trump interviewed by CNN anchor Alice Cammerota, transcript, 20 October 2015: http://edition.cnn.com/TRANSCRIPTS/1510/20/nday.03.html .
. Al Gore, “The Assault on Reason. How the politics of fear, secrecy and blind faith subvert wise decision-making, degrade democracy and imperil America and the world”, Bloomsbury, London, 2007, pages 177-179.
. “Preview: Hamid Karzai says al-Qaeda is a “myth’”, Al Jazeera, 10 September 2015: http://www.aljazeera.com/programmes/upfront/2015/09/preview-hamid-karzai-al-qaeda-myth-150910101842572.html?utm_source=Sailthru&utm_medium=email&utm_campaign=New%20Campaign&utm_term=*AfPak%20Daily%20Brief .
. “Study: Bush, aides made 935 false statements in run-up to war”, CNN, 2004: http://edition.cnn.com/2008/POLITICS/01/23/bush.iraq/ .
. “Palestinian Genocide” : http://sites.google.com/site/palestiniangenocide/ )..
. “Iraqi Holocaust, Iraqi Genocide”: http://sites.google.com/site/iraqiholocaustiraqigenocide/ ).
. “Afghan Holocaust, Afghan Genocide”: http://sites.google.com/site/afghanholocaustafghangenocide/ ).
. Steve Toth, “Help! I’m stuck on page 2 of Google Search results”, TechWyse, 19 October 2015: https://www.techwyse.com/blog/search-engine-optimization/stuck-on-page-2-of-google/ .